Monoprint, 17" x 22", water-based ink with leaf impressions and wood stamps from India. Monoprints, 18" x 25", water based Ink on handmade paper. Monoprint, 18" x 25", water based Ink on handmade paper. Three panel monoprint. each, 18" x 25", water based Ink on handmade paper. 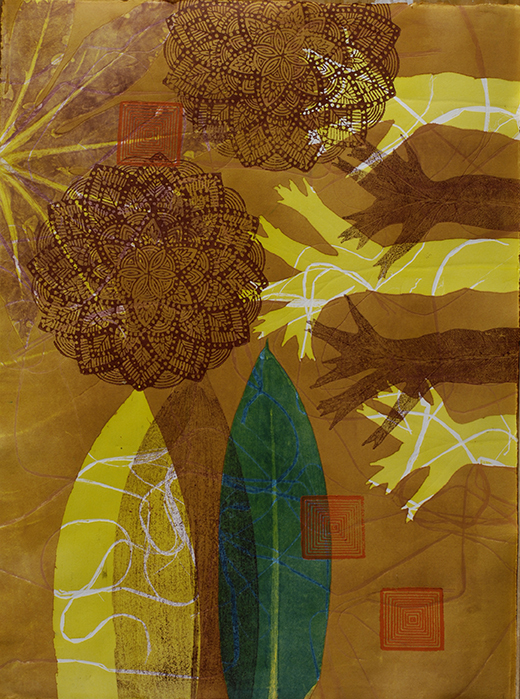 Monoprint inspired by Ikebana, 18" x 25", water-based Ink on handmade paper. Monoprint inspired by Ikebana, 12" x 12", water-based Ink on handmade paper.